Steels rust and they always will. 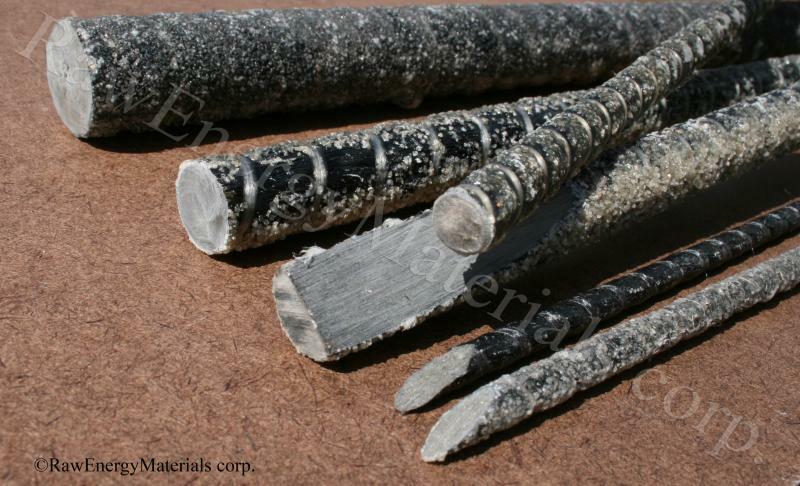 RockRebar®﻿ is a composite material. Composites have largely displaced rusting steels and corroding aluminum in boats and the marine industries. 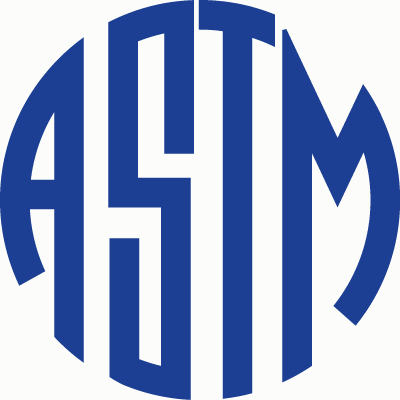 Nearly 50% of airliners built today are some form of non- metallic composite. Faced with weakened economies and our infrastructure in such bad repair the civil engineering community is finally waking up to the enhanced cost performance offered by shifting to composite structural materials. As we pull out of this economic slump the survivors are looking for a leg up over the competition. The recent increased production of RockRebar®﻿﻿ has reduced its price to parity with the initial cost of corrosion resistant steels. 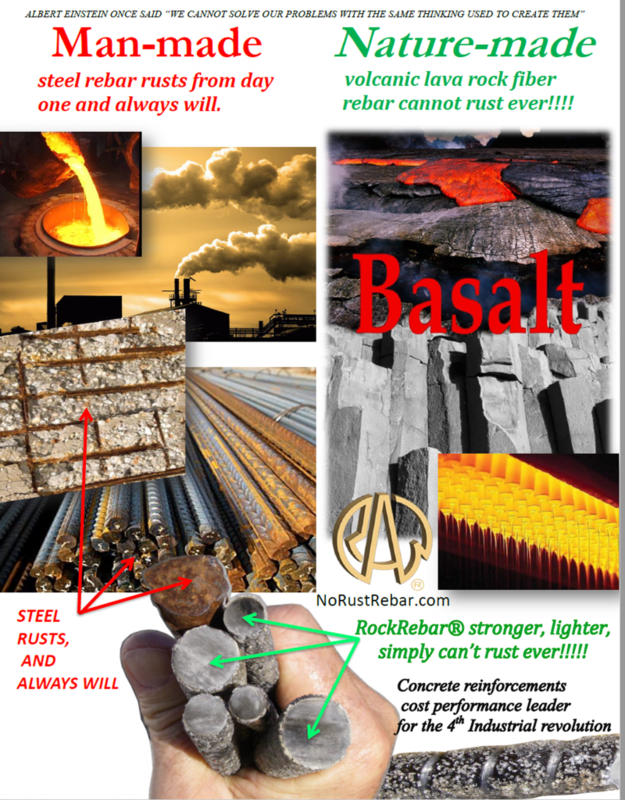 When cost, logistics and service life performance are considered RockRebar®﻿ (basalt rebar) works out to be far more economical than steel. 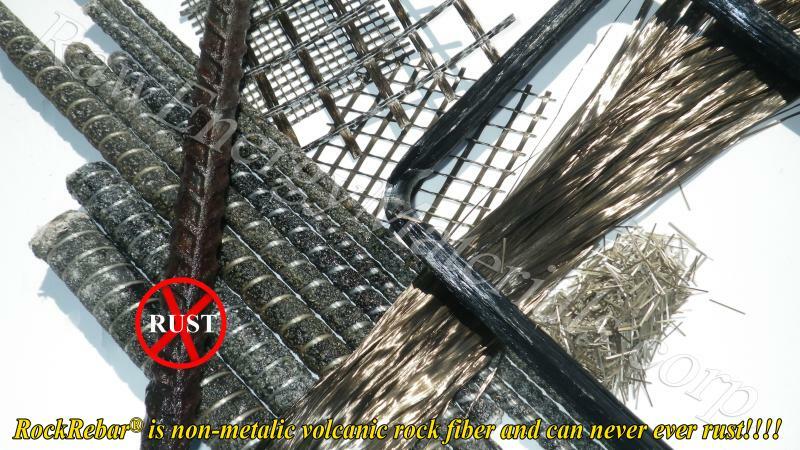 Our products are based from only one single homogenous component, "natural volcanic basalt lava rock" processed into continuous fiber tendons. As a result our products are at or very near carbon footprint neutral. 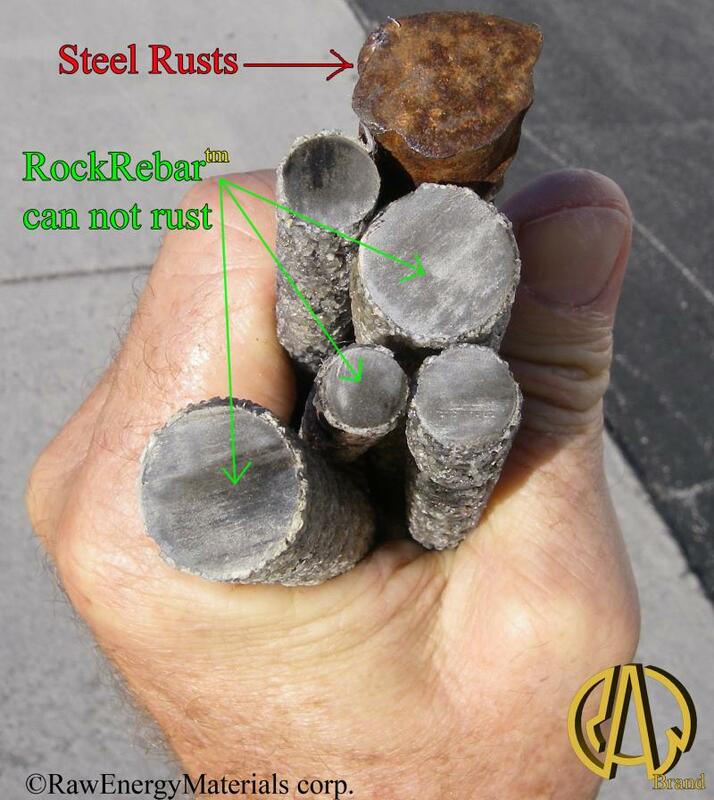 The cross section of each rod of RockRebar®﻿ (basalt rebar)consists of 10’s of 1,000’s of these very tenacious continuous Basalt filaments. 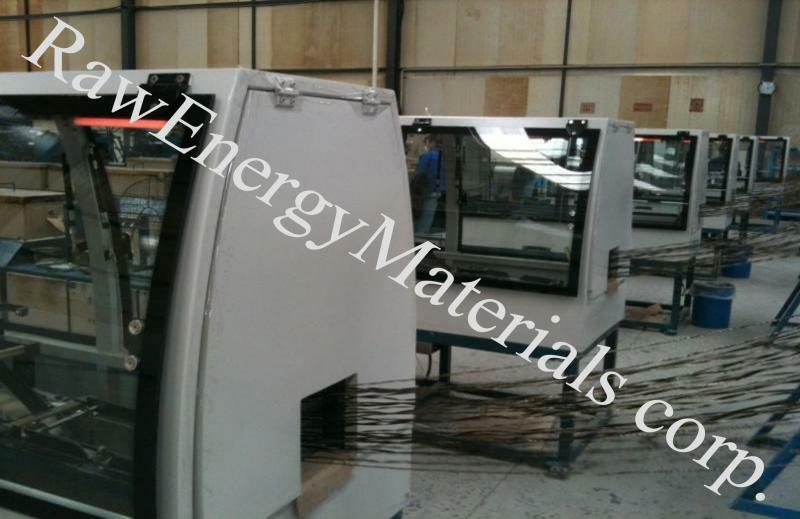 Each filament is coated with a preparatory epoxy polymer. All filaments are stretched equally taunt and compressed together parallel to each other forming a tight stiff hexagonal lattice that results in RockRebar®﻿﻿ composed 80% of continuous basalt fiber and 18.5% by volume of a preparatory epoxy polymer. Epoxy polymer matrix adhesive not only solidifies the fibers together it also enhances the natural chemical bonding of basalt with Portland cement. Before the RockRebar®﻿﻿ adhesive is set; the epoxy polymer coated fiber bundles are wrapped with a visible white S fiberglass winding. 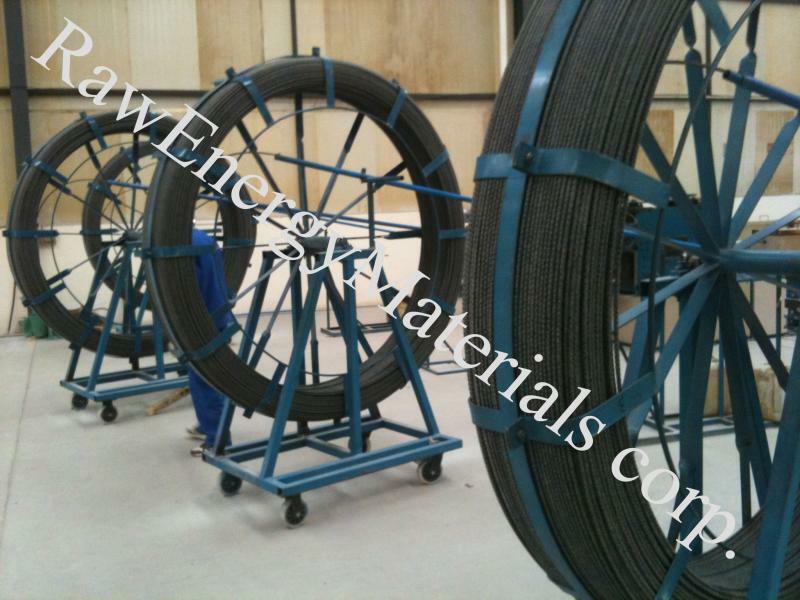 This winding produces spiral deformations in the uncured fiber polymer matrix that provide optimum mechanical lock within the concrete. 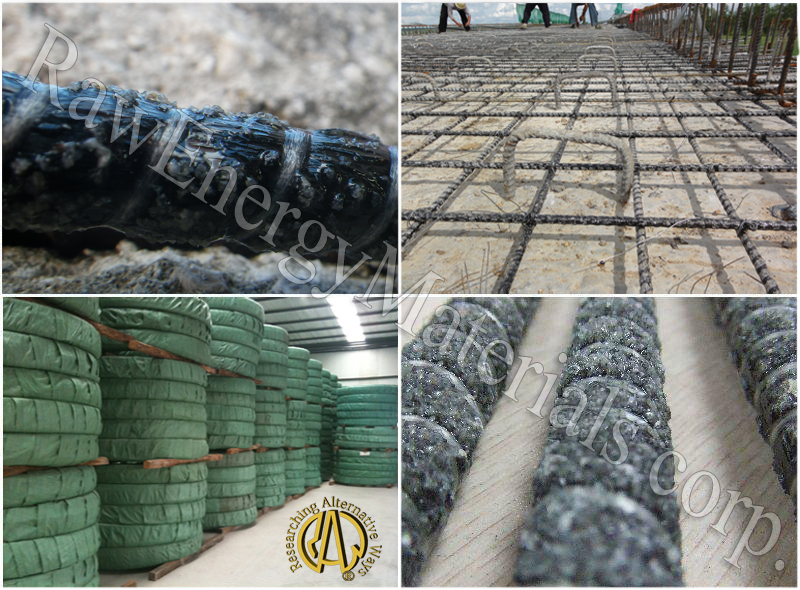 At the time of curing to set the epoxy resin the bundle is coated in quartz sand and cured into RockRebar®﻿﻿ too become a sustainable, totally non rusting concrete reinforcement. RockRebar®﻿﻿ is conservatively 2.2 times the tensile strength of series 60 steel at only 1/4th the weight. Copyright 2013 RAW MATERIALS CORP. All rights reserved.